PMI Model No. 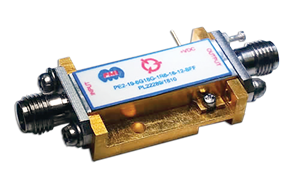 PE2-19-6G18G-1R6-16-12-SFF is a low noise amplifier which operates between 6.0 to 18.0 GHz. Ths LNA provides 19 dB of small signal gain while maintaining a low noise figure of only 2 dB. The P1dB output power of 15 dBm enables the LNA to function as a LO driver for balanced, I/Q or image reject mixers. This model also features I/O's that are DC blocked and internally matched to 50 Ohms.